As the domestic football season comes to a close, football fans around the world are often left yearning for yet more action and every four years this will come in the form of the FIFA World Cup. The qualifying stages are over, the groups have been drawn; all that is left is for the squads to be decided and for the games to be played. Thirty-two teams split into eight groups of four, with only the top two advancing into the knockout stages. But which teams from each group will advance? In this series we take an in depth look into some of the major team’s strengths, weaknesses and chances, starting with the hosts themselves. Automatically qualifying this year as hosts, Brazil go into this World Cup with colossal expectations as the home country. Despite not being involved in the extensive league qualifying campaign that other South American countries must perform in, they have prepared with a series of friendlies in order to prepare, winning the majority of them, suffering just one loss in the past year in a shock 1-0 defeat to Switzerland. Other than that minor setback, Brazil have appeared strong and ready for the mountain of teams they will have to climb in order to achieve victory on their home turf. Despite the great expectations, one look at their squad will assure any football fan that this year’s interpretation is but a shadow of the legendary champions of the past. Strengths: Having conceded just 6 goals in their last 14 games, Brazil’s obvious strength lies in their defense. A back four of Marcelo, Thiago Silva, Dante and Dani Alves includes four world class players, each from arguably the four best club teams in the world (Real Madrid, PSG, Bayern Munich and Barcelona). The full-backs may have the tendency to push up too far, but neither particularly lack in defensive qualities either when they are in their own half, and the ability for a full-back to link up with the attack should never be viewed as a negative quality. Both Dani Alves and Marcelo should be viewed as complete players that seem to excell in the majority of situations in football. Opposition teams may therefore choose to focus their attacks through the middle rather than out on the wings, however the majority of strikers that have to face up against the formiddable duo of Thiago Silva and Dante would undoubtedly be quaking in their boots. The two towering defenders both have a valuable mix of strength, speed and readability of the game, enabling them to both physically and tactically outclass their opposition. Weaknesses: In the rare case that Brazil’s defence is penetrated, Brazil lack a truly world-class goalkeeper between the sticks. Since the retirement of Dida, the chosen successor was Julio Cesar, who up until the last couple of years has been nothing but world-class. However, since his bizzare transfer to Queen’s Park Rangers and their unsuccessful Premier League run, he found himself dropped to ex-England stopper Rob Green and transferred to Toronto FC in February earlier this year. Despite the MLS being an ever-improving league, it is still not a top level of football and Cesar may not be offered much of a test in his run up to the World Cup. Brazil’s alternatives don’t offer much either, with other recent call-ups Jefferson, Victor and Diego Cavalieri all plying their trade in Brazil’s Série A. Another potential weakness is their reliance on the talisman that is Neymar. Barcelona’s £50m signing carries the hope of a nation on his shoulders this year. As Brazil’s top current goalscorer despite not being an out-and-out striker, a lot of people will be hoping that he can deliver this summer. The pressure for the young 22 year old may just prove too much and bring out a degree of inconsistency to his flair-based game, which will frustrate both him and his teammates to no end. Brazil will have to hope that in case this happens, fellow strikers Fred and Jô can chip in with goals of their own to propel Brazil into the final stages of the tournament. Star Player: As touched upon already, Brazil’s talisman is undoubtedly Neymar. Having finally secured a move to Spanish giants Barcelona after years of interest from them, Chelsea, Real Madrid and others, he has thrived on the elevated platform and fully utilised his opportunity to showcase his talents. His club form has been replicated on the international stage too as demonstrated by his goalscoring record (30 goals in 47 appearances). In the summer, expect Brazil’s team to be built around Neymar and his talents. One to Watch: Known at club level for his energy and speed, Bernard is a talent that could be overlooked by the opposition at their demise. With incredible dribbling ability and a penchant for flair, the fleet-footed Brazilian could be making waves in a few months as he weaves his way through defences and creates chances for his teammates. Prediction: Looking at Brazil’s group, they’ve been given an easy one this year and should really capture all 9 points on offer with 3 victories, but may struggle against Mexico, who I personally tip as potential dark horses for this tournament. After winning the group stages they will be matched up against the second placed side in group B, which will most likely be either Spain or Netherlands, both a momentous test for Brazil and will hopefully produce one of the matches of the summer. I’d tip them to beat Netherlands, but Spain may be one of the few teams that can topple Brazil this year. 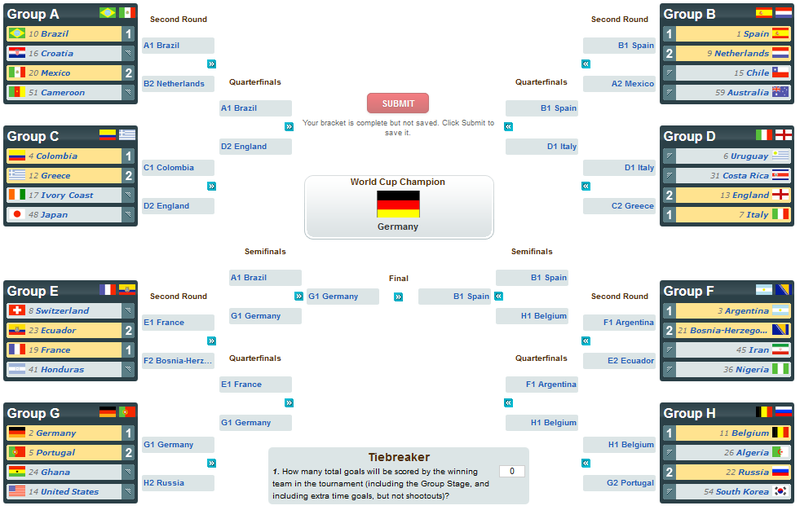 According to my prediction bracket, Brazil will make it to the semi-finals only to be toppled by my personal favourites, Germany. Regardless of whether you agree or disagree with my decisions, please post comments and feedback! This is the first of many for this series. I don’t plan to cover every single team due to time constraints and the fact that I have exams coming up soon that I MUST study for, however if anybody were to request a specific team then I’d be more than happy to oblige. Thank you for reading! 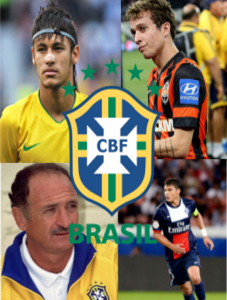 This entry was posted in Uncategorized and tagged adidas, barca, barcelona, bernard, brasil, brazil, brazil 2014, brazil world cup, brazilian culture, culture, england, fifa, fifa world cup, fifa world cup 2014, football, group a, neymar, nike, preview, psg, rio, scolari, soccer, squad, travel, world, world cup, world cup 2014, world cup brazil. Bookmark the permalink.